I was reading the “Notable Deaths” page in my Sunday newspaper (September 14) and came across the news of the passing of the famous Irish Presbyterian minister, Ian Paisley. The AP report said: “Paisley [was] the Protestant firebrand who devoted his life to thwarting compromise with Catholics in Northern Ireland only to become a pivotal peacemaker in his twilight years.” Paisley was 88 when he passed away last Friday. 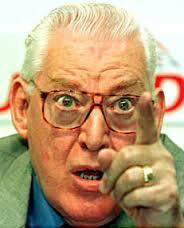 Ian Paisley was bigger than life in so many ways. (He was a big man and his voice and size could intimidate you very quickly!) I never heard Paisley preach in person but I listened to him a number of times via audio tape, online audio and television. He was a marvelous orator. Ian Richard Kyle Paisley, Baron Bannside, (6 April 1926 – 12 September 2014) was a Unionist politician and Protestant religious leader from Northern Ireland. Paisley was, if he was anything, the definition of strident. He was also courageous and intensely interesting. He had a great laugh that could disarm you once you got beyond his bombastic public side. Ironically, Paisley was one of the few strongly Reformed ministers that I think was ever invited to preach at Bob Jones University. I am inclined to think that this underscores how much the leadership at BJU appreciated his stridency and courage. I could share stories about Paisley that would make you cringe. I could also tell you things I knew about Ian Paisley that would make you appreciate his humanity, warmth and genuine expressions of love for Christ. But this is not the time or place. What I can say is that his latter years give me immense hope. Sometimes men who age do so very gracefully. Some have said they grow weak and compromise. I think some begin to “see” more clearly that being a “peacemaker” is truly part of following Christ and must become as important as being courageous and convictional. Perhaps this is why Paisley’s passing spoke to my own life. I was never a strident fighter but I was not a convictional peacemaker in my earlier years. 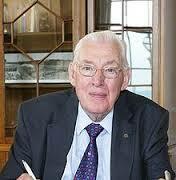 I took immense encouragement in seeing the elderly Ian Paisley seek peace in Northern Ireland. That took, so far as I am concerned, as much courage as it took to stand so strongly for his views for so many decades. It felt like betrayal to some of his best friends. I understand this and relate to it deeply. I have come full circle at this point to the words used by the Associated Press to describe this larger-than-life man. AP said Paisley was a Protestant “firebrand” who “devoted his life to thwarting compromise with Catholics.” I can handle both of those in their right place. I can even respect, at least to some degree, such views if they are honestly situated within a context of a courageous love that truly pursues peace and justice. Paisley seems to have discovered this very late in his life. That gives me great joy and hope. Enemies can become friends! Firebrands can become peacemakers! Anti-Catholics can learn how to listen to Catholics with respect and love! Paisley’s overall narrative is not a model for me, at least not in terms of his lifelong legacy. Yet his last years bring me immense hope when I see how men like him, who seem impossible to get along with relationally, can and do change. The Spirit is always working, especially in the most broken among us. This means that people like some of you will change. But most of all this includes me. As I look back over the fifteen years or so of my thirties, and my early forties, I often feel like “the chief of sinners” when it comes to rhetorical flourishes that divided Christian from Christian over doctrine and political conflict. At times I still live with intense regret about this part of my life. What I must do is continually seek the Spirit’s grace to love more deeply because God never stopped loving and changing me. I was thus profoundly thankful, when I read the Paisley obituary, that the Spirit never stopped working in the life of Ian Paisley, a really big and intimidating Irish Presbyterian. My guess is that Ian Paisley will be most remembered, and this will be with profound joy by many who knew him, for his latter years of life. This also means, if I am right, that for the largest portion of his public life, the years in which he lived in constant militant conflict, his work will come to nothing truly lasting. I say this because “faith, hope and love” abide but the only one that truly abides forever is love. Reflecting on Ian Paisley’s life makes me ask: “Can people of profound conviction become convictional peacemakers who are filled with grace and truth?” I think Ian Paisley did exactly this in his last years. I also think that if he could speak to us now he would point all of us to his Savior and tell us that his last years were the most important ones in all his years of service for Christ and his kingdom. Rev. 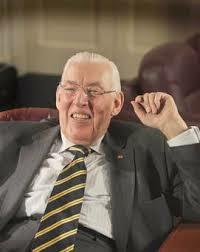 Ian Paisley, warrior and peacemaker, RIP. This is by far the best comment on Paisley’s life I have read. You have nailed it! Years ago (1980s) I knew an Irish Methodist who knew Paisley. He told me that the “public” Paisley was not the private Paisley. Difficult times often breed difficult and complex people. As you have noted, Paisley was difficult and complex, but apparently also flexible. It’s encouraging to read that some rigid, inflexible, dogmatic, intolerant, exclusive firebands can change as they mellow out. What are some examples of Ian mellowing out? How about sharing power with former IRA commander Martin McGuinness, who said on the day of Paisley’s death, “Today I have lost a friend.”? Peace is not made between friends. Peace is made between enemies. Before we go further down the Fred Phelps road, we would be wise to read Gerry Adams’ obituary. Stridently fighting for one’s convictions could very possibly be different from fighting for the Truth. In fighting for the Truth, we are shamelessly holding up Jesus as Lord. If people separate over loyalty to Jesus, then that would align to our Lord’s own experience. But if people divide over dogma/doctrine, that aligns more with those like the Pharisees who were more concerned with preserving religious traditions and practices, rather than promoting relational harmony found in a peace loving Savior. Cam West, this was no Fred Phelps as the comments above indicate. Not even close. Easy to see why you might think that but Phelps was a sick and sad man. Thank you John. You’ve helped me to remember this man with appreciation. Thank you John H. Armstrong for giving all who have had to live as “Warriors” can find grace to become the peacemakers we ought to be. Great post. thanks for the beautifully written and most encouraging words on ian paisley! Jonathan Hancock liked this on Facebook.